We’ll take that as a wink-wink, nudge-nudge, seeing as the Aussies love fast saloons, and there’s clearly a market for them on the island continent. Anyway, back to the Aurion Sports Concept. It’s finished in Inferno Red with contrasting metallic grey accents where you’d find the more pedestrian chrome bits on a regular Aurion. In front, the car’s aero kit is complemented by a floating grille frame with a mesh insert. The grey accent color carries the grille and upper half of the bumper down to the lower lip spoiler, recalling the type of look VW went for with its R-GT Passat in NY last April. That’s not a bad thing at all, actually. It looks great here. In back, the upgraded rear bumper features integrated exhaust outlets and a diffuser insert. The big 5-spoke wheels are painted in the same metallic grey finish as the rest of the car’s trim pieces. Finally, the glass and roof all get a blackout treatment. Good stuff. 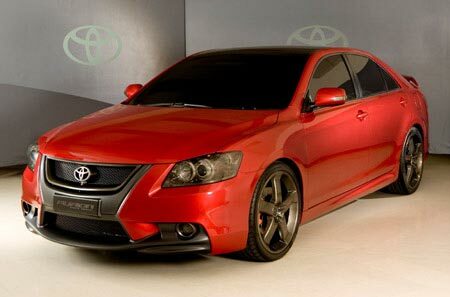 Let’s see if TRD can work up something this cool for our version of this car, the Camry. 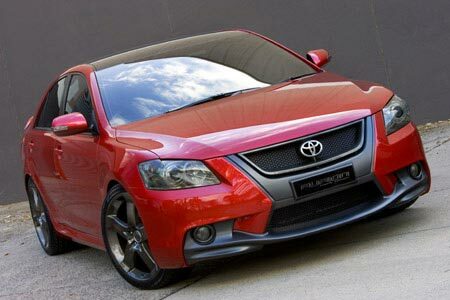 Toyota Australia has unveiled a dramatic red and black sports concept sedan based on its new Aurion large car. The Aurion Sports Concept, created by Toyota Style Australia, is one of the stars of the Australian International Motor Show in Sydney. It features aggressive styling and aerodynamics with integrated front and rear air-dam diffusers, a prominent two-tier rear wing and 20-inch five-spoke dark charcoal alloy wheels. The dramatic exterior styling theme is enhanced with glass-infused mica metallic ‘Inferno’ red paint, incorporating a tonal Aurion graphic on the lower body sides. Contrasting with the hot body colour are metallic grey body cues around the windows, grille and trunk-mounted lower rear spoiler. All glass is blacked out and, along with a black roof, creates the impression of a futuristic one-piece glass top. Other special features include a floating grille frame with embossed mesh insert and twin exhaust pipes integrated into the rear bumper. Paul Beranger, Manager of Styling and Design at Toyota Style Australia, said the show car was an advanced styling concept from Toyota Australia’s young design team. “The Aurion Sports Concept is a vision for the future styling direction of Toyota Australia’s sports-car image,” Mr Beranger said. “Many of the design cues are likely to appear on production vehicles that go beyond Aurion’s new sports range, the Sportivo SX6 and ZR6. “Our creative team is continually experimenting with ideas for the Australian customer. Previous programs such as Cross Runner and Sportivo Coupe have been winning concepts with the Australian public, and now the launch of the Aurion brings a whole new range of opportunities for Toyota to move into more niche market segments. Mr Beranger said Australian drivers were unique in wanting both a sports car and a family car in the one package. “The Aurion Sports Concept is one possible solution, with styling themes slanted heavily towards the sports car end of our youth market,” he said. The Aurion Sports Concept is purely an exterior styling exercise. Toyota Australia is still keeping under wraps many of its styling and engineering plans for future models. 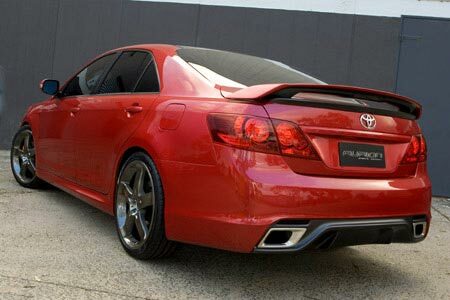 However, from a performance perspective a sports sedan based on the Aurion could be expected to be powered by a supercharged or turbocharged version of an advanced Toyota engine. Hi! I could have sworn I’ve been to this site before but after browsing through some of the post I realized it’s new to me. Anyhow, I’m definitely happy I found it and I’ll be book-marking and checking back frequently!